One of the vacation projects was putting cement board siding on the outside of Loven. Ick; that cement board is nasty, but the cladding needs to be fireproof. Now to paint it all and put the galvanized roof on…maybe I need another vacation? Ah! A week off from work. The place looks really spiffed up (projects begun, projects completed, chaos swept away). And: I have bruises in strange places. About a third of my work as an architect is designing second homes for Chicagoans keen to have a spot on this, the better, side of the lake. You’ve heard about second homes, right? They are acquired because the first home is wanting. But me, I find it hard to ever leave my first home! And why should I? I would rather be home than anywhere else. And it is just as well. There’s plenty to do. Greenhouse #3 is even big enough to have a place to sit. 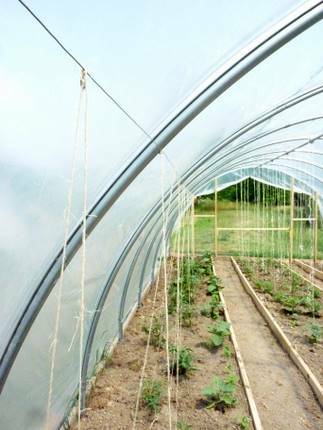 The new greenhouse layout is perfect for growing long rows of indeterminate tomatoes. It is no secret that I abhor staking tomatoes; I have devoted many posts to this dislike, yet I still grow and stake them. So I tried a new method on Thursday morning, as it was the best time to do it: cloudy, breezy, and the Supreme Court was due to make its final rulings. Instead of sitting by the radio being pissed off, I took to the greenhouse to change what I can. This is 17 gauge fence wiring. There are many uses for a roll of this stuff; in point of fact, I have never set a current to this wire…and I have gone through an eighth of a mile of it since I bought it. I stretched the wire between the bows, using self-tapping screws held off from the bow just enough to allow a wrap of the wire. 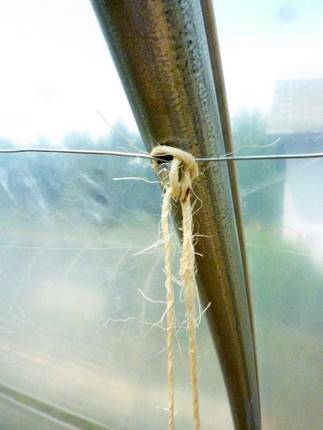 Then, I stake the tomatoes by tying sisal twine to the base of the plant, stretching the twine up and knotting it over the fence wire, then draping it back down (for when the plant gets taller/more unwieldy). Pretty simple all around. I have plenty of screws, plenty of wire…but I ran out of sisal. I trim to one main stalk, and am maniacal about trimming all future suckers until the plant gets about five feet tall. Wrapping with the sisal is fairly easy. Up twisty up, avoiding the fruit branches, loose enough to allow it to grow. At its biggest point a plant might require up to four strings to hold it aloft but sisal is cheap. The wire shouldn’t bend much under the weight; between the 4′ span of the bows there are only two, maybe three plants. And they will all grow to hit the roof sooner than later. And by the time I finished with this task (yes, doing 76 plants takes a bit of time) I turned on the radio and surprisingly wasn’t angry by the rulings! Ah, a morning well spent. 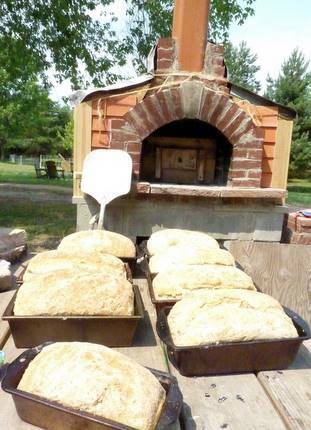 This entry was posted in greenhouses, masonry oven, politics. Bookmark the permalink. Here’s hoping you get to do whatever you want, or don’t do whatever you don’t want, that you get to be right ALL DAY LONG, and a wish for many more! I need a system for my greenhouse tomatoes for next year, maybe I’ll try the fence wire. My husband built some aframes for my 3×16 ft tomato beds, but I don’t think they’re going to be tall enough. Did you use the wire for the tomatoes in the center also? I’m with you – I’d much rather stay home than go away on vacation! I live where Sydneysiders come to “get away from it all” for a day trip or weekend break. They come for the peace and the beauty of our area. I love having that every day, and never feeling a need to “get away” from my life! I’m in the club too then, summer in WI (I’d say the better side of the lake, hah!) is where everyone wants to be, why would I want to leave? 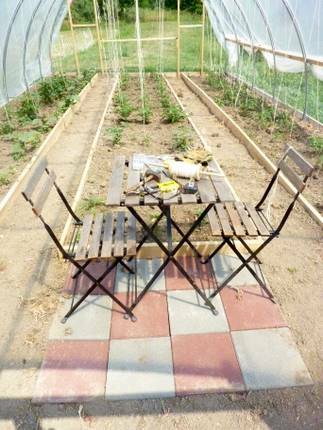 And you’ve finally motivated me to write up my new tomato trellis method…a variation on a theme. I did the exact same as this though for my cucumbers in the hoop, it works great! That sure is disciplined tomato growing! I live where people vacation, so I’m super good. Happy birthday! I remember now that you share your day with my son! I’m equally inspired and shamed regarding the tomatoes. Mine are sitting slumped in cages as I type, needing to be staked, supported and loved (oh my, don’t we all?!). My vacation this year is my newly off-call status. This means I can spend as much time outside sans phone as I want and that I can drink a beer (or two!) any hot evening I feel like it! Luxury! I’m trying something like this with my tomatoes this year. 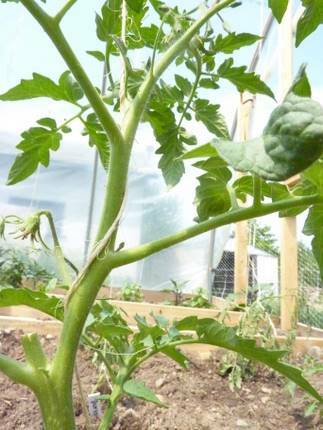 I’ve heard that another nice thing about this method (especially in the greenhouse’s long growing season) is that you can take advantage of the indeterminate tomatoes’ growth: as they get too tall, loosen the twine to let the lower part of the stem rest on the ground. The stems will send out roots (I can’t remember if you’re supposed to pile a little more dirt on them to encourage this) and the fruits stay at a good height for picking. I’m still gazing longingly at your greenhouses, and without one of my own the tomatoes never get tall enough to warrant this treatment, but I’d love to try it someday (or try it vicariously through someone else). I am just about to rip out most of my tomatoes as it is getting too hot here for them. I’m only leaving some of them to finish off ripening the fruit on the vine. A couple of mine got probably 10 feet tall. Good thing I grow bamboo in my backyard (clumping, not running, God forbid!) We have taken cuttings and have them in little pots to start our fall garden, when tomatoes get a second life. We’ll plant them out in August so they can start to grow while it’s hot, then flower when it starts to cool off in October. We only cut the ones we liked, out of the 7 new varieties we got at Tomatopalooza. The peppers are loving the heat. After reading, I realize that you don’t take vacations, but if you ever get to the Northeast, I hope you will come to our homestead in Vermont and build a Loven AND greenhouse for us! We are at the “bartering extras” stage of our farm. I dream of CSA shares one day and appreciate everything you do and post about. You are an inspiration and kindred spirit. Sabine is adorable! I just found your blog through Granny’s.. and look forward to following, your land and greenhouses are so pretty.. it will be fun to follow alone! Hi Elizabeth. Yes, for the center bed, I used the existing purlin (horizontal pole) and strung up 2 other wires on either side of it for the three rows in this bed. So it is actually a forest of twine in there. If they don’t work for you maybe you can recycle the A-frames outdoors next year for your beans or something? I like this method because there’s really no wind in the greenhouses so the things won’t take off or flop over so it can be kind of loose. Good luck! Hi Darren, yeah, I agree. It is nice to live where people want to visit! I just wish they weren’t so loud on the weekends, sheesh. Then again, we just had our Independence Day so I suppose even the locals were setting off those fireworks, but I would rather blame the Chicagoans. Sara, yeah, I think it would work with anything that needs to grow up. I keep forgetting though that not all my cucumbers (peas too come to think of it) have the smarts to climb up a trellis or a string on their own. I hate finding the fruit on the ground; gotta be more vigilant. Happy summer though! Stef, disciplined, check. Love tomatoes! Also, we who experience winter kind of take summer as a marathon to be endured…at least where the hot-seasoned crops are concerned. Green arms be damned. And Amanda at least it is now cool enough outside for you to do so! Yuck what a couple of weeks, eh? Revel in your freedom, and go love your tomatoes! they’ll love you back I am sure. And happy birthday to your boy, heee! Welcome, Tasmania. Hopefully the tip will come in handy in about 6 months for you, eh? I envy you your wool socks right about now. Diane, interesting. I can see that happening with some tomatoes I really loved: if I could grow them all year that would be a simple way of propagating them (2 plants for 1!). Anyway, I am glad to at least give you something vicariously. Glad everything went well for you this year tomato-wise, Jules. What a good idea about the cuttings. It should turn out great for you. And it was a bummer year for rhubarb for me incidentally! Aw, thanks, Christine. My MIL used to live in VT (Shelburne) but is here now…otherwise I would make the trip! Thanks for the love. You’re quite on the path, incidentally…before long you’ll be as fool-busy as me! Granny, thanks. It is true: change what at least you can, and can the rest! The Squeezo Season is soon upon us. Looks like a banner year for the Concords. Hi, Cecilia. Our bricks are exposed but they are fine; the whole thing is covered to keep it warm (thus the orange siding and the plastic tarp for now) so it can be used year-round. I would think it would make a great addition to your place! I cook everything in it on Sundays (and thus don’t need to cook much during the week, a bonus when it’s hot. Thank you, Smidge! Glad you found me; happy harvests! Thanks El. Did you say your beds are 4ft wide and you are putting 3 rows of tomatoes? That seems quite close spacing, is it because you are using a vertical trellis system and pruning that you can plant them this close? Exactly. Another reason to prune heavily. (Actually the middle bed is about 4.5′ wide but yeah that’s fairly dense spacing either way.) The outer beds have staggered rows and there’s a whole 18″ behind them that I put other things in (sweet potatoes one side, leeks the other). I kind of counsel people to not overcrowd their beds but I am the worst offender…keeps the weeding down! Oh…you said the ‘R’ word…Rhubarb!!!! I pulled out the last package from the freezer last week and made a rhubarb and fig cobbler, and with the rest of the fruit, I made a preserve sort of thing for biscuits! My rabbit lady gave me figs when we went to check out her setup. Recipe said strawberries, but I had figs, and both concoctions were wonderful. But…alas, I have no more rhubarb. We’re planning on coming up next year in June for Mom’s 75th birthday. Maybe I can snag some if it’s not too late in the season. This year, one of my tomato plants has a branching sunflower to use as a living trellis. It means there are two intertwined pruning tasks, instead of just one, and theoretically competing for resources should stunt them both. 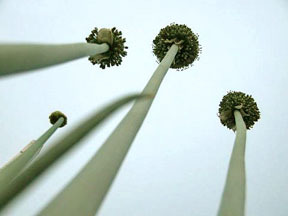 However, they both seem to be very vigorous in every way, producing fruit and bouquets and getting quite tall together with only a little guidance as to structure. I’m pretty happy with the method so far; we’ll see what it’s like when the stalks have to support the weight of a lot of fruit (pruning is now focused on encouraging thick stalks of moderate height), and good ventilation might get challenging to maintain after a while. I HATE trellising tomatoes, and yet this year I have three huge beds of them (50 plants, give or take). But tomorrow it’s not going to be jungle hot any more, so out I go. I also string from the top, fwiw.